As I mentioned before, Ryan and I were away from the apartment for 4+ weeks. I originally didn’t intent to be away for that long. I knew 3 weeks was a little long, but I knew they would be ok for 2 weeks, and I was willing to risk the extra week. Little did I know that the East coast Polar Vortex had another plans for me. When my flight was canceled, they weren’t able to schedule me on a plane for another WEEK. Luckily, I was just at my in-laws and I wasn’t stranded in the airport or in a hotel for that extra week. It was pretty lovely and I worked from home. So, my poor fish. We had 11 fish in a 20 gallon tank. I cleaned the tank before I left and had a timer on the light. (I have plants in there – so I wanted to make sure they wouldn’t die.) I lost 2 fish, which probably became fish food for the rest of the fish (yeaaaaaah…), and my aquaria was infested with red and brown algae. I guess that was to be expected. All of my rummy nose tetras survived. The neons, though, didn’t do well. My 2 cardinals were fine. The algae just made my tank LOOK SO UGLY. I was pretty depressed about my tank and when I came back, I cut the amount of light to the tank to restrain the growth. 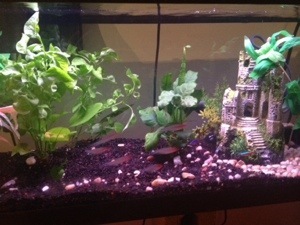 (Of course, I also did frequent smaller water changes to keep the nutrients out of the water.) It helped a little bit. The second step was to buy some extra plans so that they out compete the algae for the light. The third step, which made me nervous, was to do a bleach dip of the old plants covered in algae. (They won’t be able to get light and they are going to die. My java fern was already turning all sorts of red shades.) I made a solution of 20 parts water and 1 part bleach. I soaked the leaves and stems for 1-3 minutes (depending on how fragile the leaves where) and rubbed off as much algae as I could without damaging the leaves. I also did a quick bleach dip on the new plants to make sure I wasn’t introducing any pests to my aquarium. It’s been a couple of hours + a feeding and so far so good. Odd Note – The Neon tetras and cardinals were always SO skittish. I think the great hunger of 4 weeks, made them come out of their shell. That, and the fact that there is only 3 blue fish, they sort of joined the rummy nosed school. They follow them around and the result is that they are visible and not skittish anymore. They come out for food, I see them schooling regularly. I was thinking of getting 3 more neons to finish the school, but I may leave well enough alone for now.